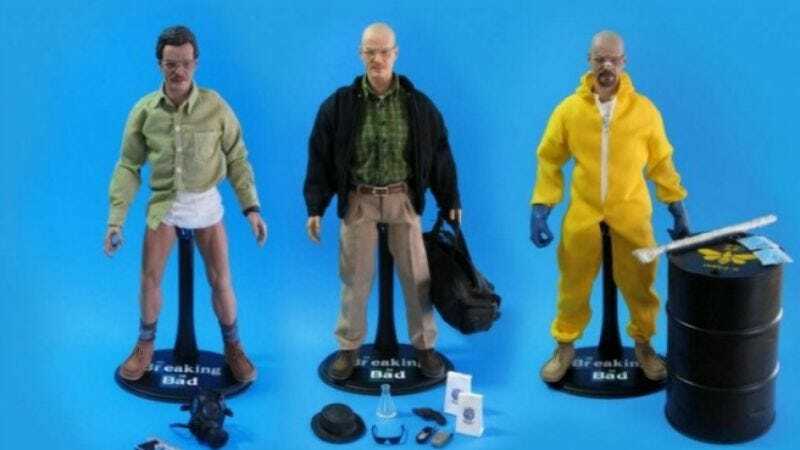 Looking to prevent her kids from being exposed to meth addiction in a way that doesn’t involve moving out of her state, a mom in Florida has launched a petition demanding that Toys R Us remove Breaking Bad action figures from its shelves. Susan Schrivjer currently has over 2,500 signatures on her call for the store to stop carrying the toys, which involve likenesses of Walter White in his Heisenberg guise, carrying a bag of his signature blue crystal meth, and Jesse Pinkman dressed in a hazmat suit and gas mask. And while these toys offer valuable lessons in maintaining quality control and the importance of safety in science, Schrivjer believes that their depiction of the drug trade compromises the “vision and values” of Toys R Us, a store that usually fosters a more benign sort of addictive behavior. “Kids mimic their action figures, if you will. Do you want your child in an orange jumpsuit?” Schrivjer asks Fort Myers’ Fox 4, sounding a warning call that kids who play with Breaking Bad figurines could end up sort-of emulating Walter White by becoming far less successful drug dealers—much as an entire generation of He-Man fans became half-naked swordsmen, and kids who played with Rock Lords became huge disappointments. And while Schrivjer calls the show “riveting” and “compelling viewing,” she argues that she shouldn’t be “forced to explain… why someone who sells those drugs deserves to be made into an action figure,” any more than she should be forced to explain why someone who sells those drugs deserves a TV show that she finds so fascinating. In response, Toys R Us has issued a statement pointing out that the Breaking Bad action figures are clearly labeled as being intended for ages 15 and up, and are located in the “adult action figure area of our stores”—and thus safely ensconced from its regular, automatic weapon-toting action figures for kids. Meanwhile, Bryan Cranston has issued his own response, once more threatening the release of noxious chemicals.